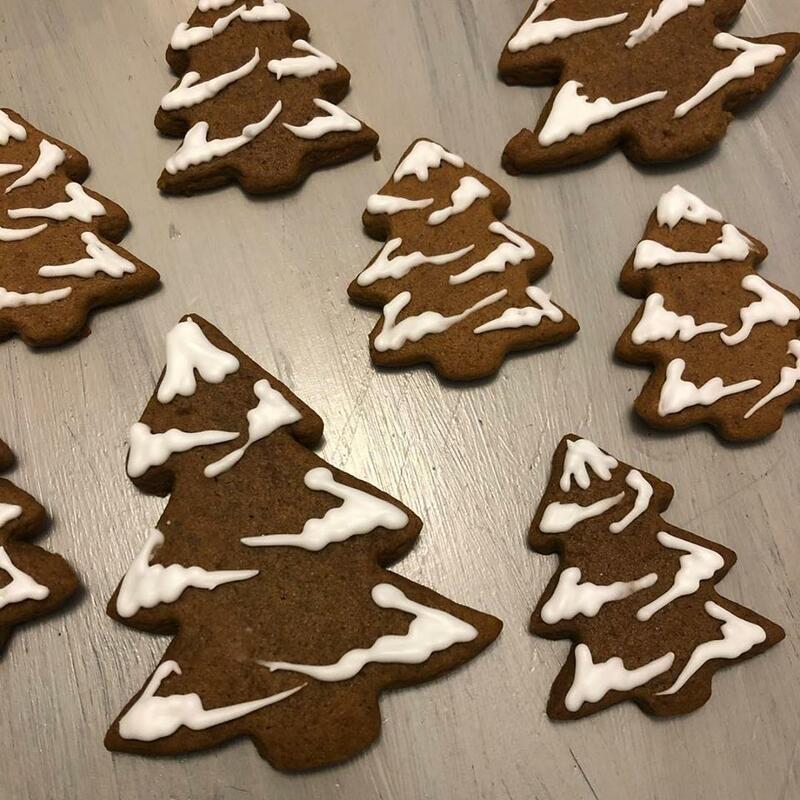 My friend Janelle made these cookies last year at our Christmas baking day, and this year I decided to make them myself, as I love lemon. 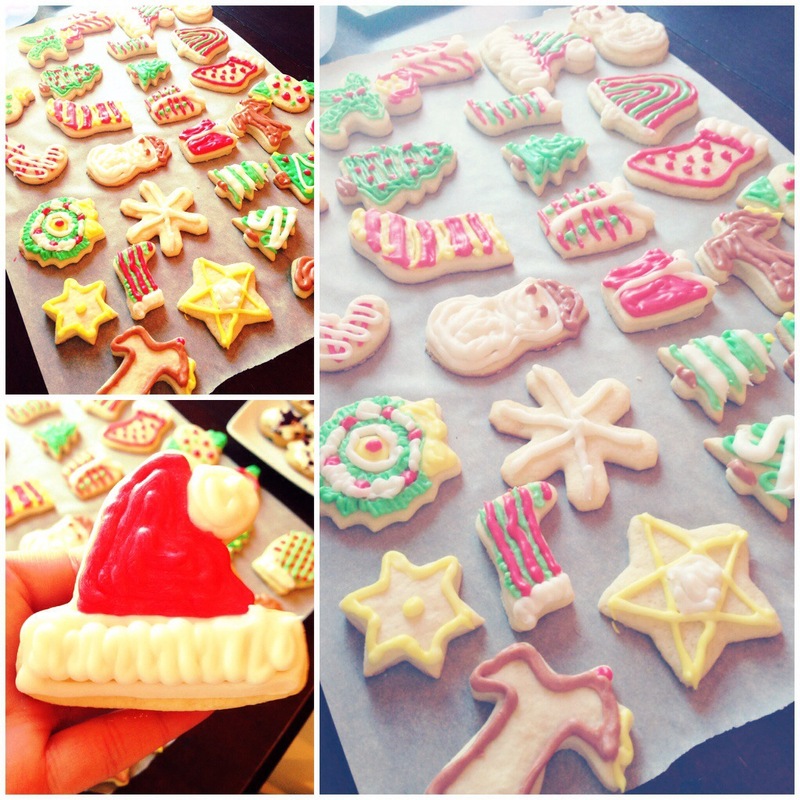 These cookies are really easy to throw together and are sure to be a crowd pleaser! Enjoy and happy baking! Pre-heat oven to 350F. Sift together flour, baking soda, and salt. Beat margarine and sugar until fluffy. Add egg, vanilla, lemon juice, and lemon zest. Beat until combined. Beat in flour mixture on low until combined. 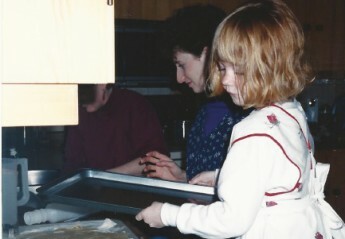 Drop by spoonfuls onto prepared cookie sheet, approx. 1″ apart. Bake approx. 15 to 20 minutes until edges are golden. Transfer to cooling rack. Combine ingredients in a bowl, and drizzle over cooled cookies. (I strongly recommend laying wax paper underneath the cookies while you drizzle.) Allow glaze to set, approx. 1 hour to 1 and a half hours. Then try not to eat them all in one sitting. This has got to be one of my favourite cookies. It comes from a cookbook called The Happy Baker, which is full of delicious recipes and funny stories about dating and heartbreak. 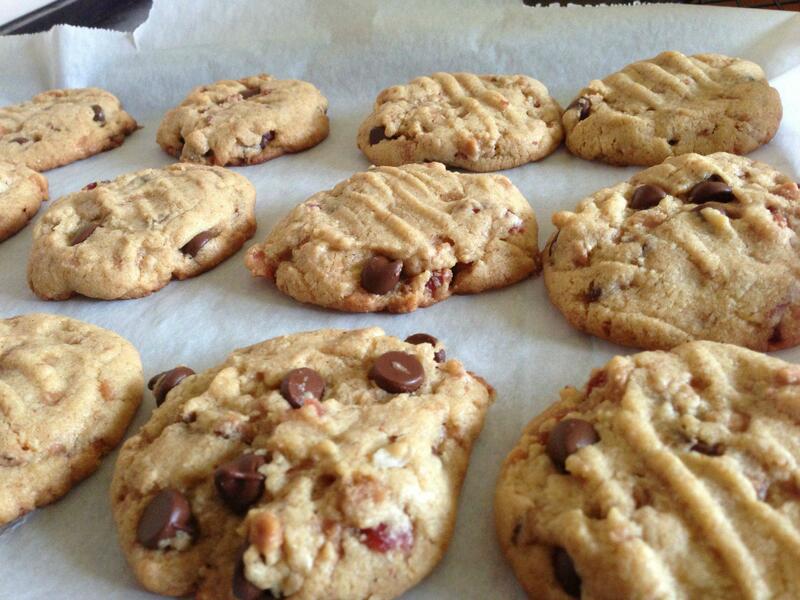 This cookie recipe combines my three favourite cookies – peanut butter, oatmeal, and chocolate chip. And there’s coconut! I hope these become your Go To cookie as well as mine. In a large bowl, combine sugars and butter, beat until light and fluffy. Add peanut butter, vanilla, and egg; mix well. Stir in flour, oatmeal, baking soda, and salt. Add chocolate chips and coconut. 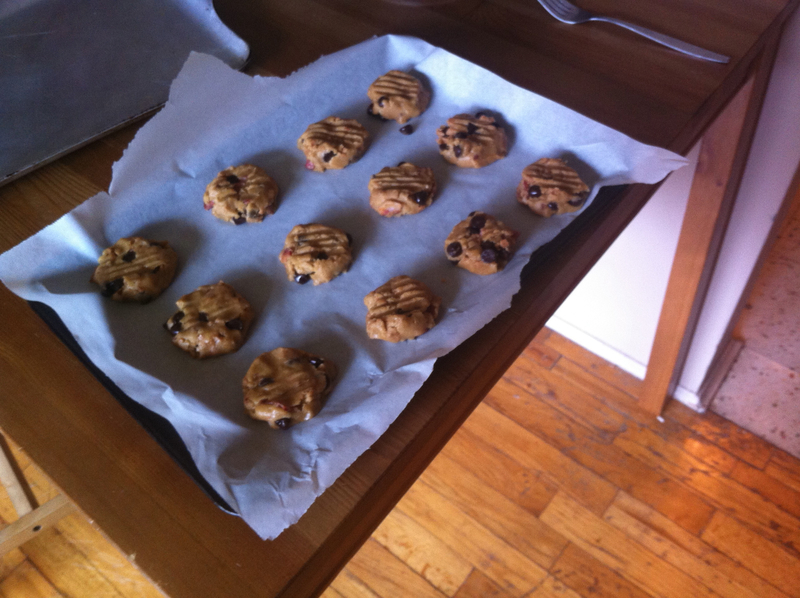 Drop by tablespoonfuls onto a greased or lined cookie sheet, approx. 2 inches apart. Flatten slightly with fingers. Bake for 10 to 12 minutes at 375F until golden brown. Let cool on wire racks. Enjoy, and try not to eat them all at once! The original recipe can be found on page 56 of The Happy Baker: A Dater’s Guide to Emotional Baking by Erin Bolger. I just made cookies awesome enough to inspire my boyfriend to brag about them to the internet (HI REDDIT! ), so I decided to share the recipe. Preheat oven to 350, adjust racks to centre. Fry the bacon until barely crispy (it won’t cook much when it’s in the oven in the cookies), then set aside to cool. Save 2 tbsp grease. Combine all ingredients on the list from flour to salt (inclusive) in a medium sized bowl, whisk to combine, and set aside. Pick apart the bacon with a knife or hands to a maximum of 1/2cm squared. Set aside. Using an electric mixer, cream the butter and the bacon grease until combined. Add peanut butter, blend until creamy. Add the sugars. Blend until smooth. Add egg and vanilla. Blend again! When all combined, add the flour mixture/dry ingredients in two or three portions at a time, and blend on low to combine. Put electric mixer aside. Use a wooden spoon to “knead”/incorporate the bacon, chocolate chips, and skor bits. Drop cookies onto a greased or parchment-paper-lined cookie sheet, and shape edges with fingers. Press with a fork. Bake for 12-14 minutes (mine took exactly 12:30 for a golden brown bottom, without drying out. But that said, my oven is super temperamental and none too accurate compared to others). Cool 2 minutes on a pan and cool on a rack after. Before they get put in the oven. 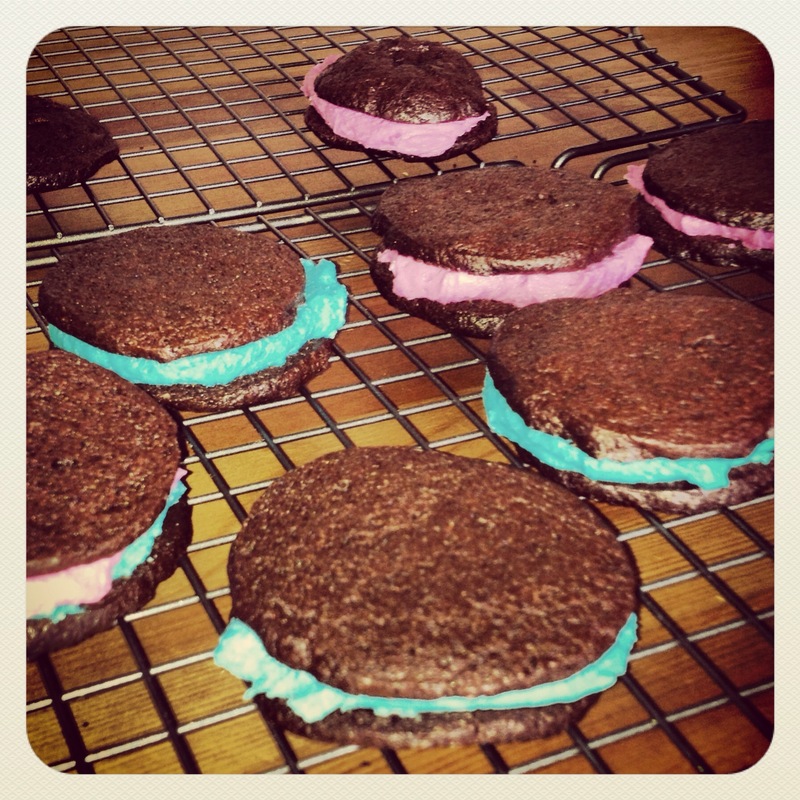 Chocolate oreo cookies, courtesy of Bakerella. The original recipe can be found on her website as per the URL above. Here is my gluten-free adaptation! Sift together flour, cocoa powder, salt, baking soda. Set aside. In a large mixing bowl, put sugar. At the same time, in two small sauce pans, melt the butter and the chocolate chips on low heat. I added some water (1-2tbsp) to the chocolate chips so they melted a bit smoother. Adding the same amount of butter helps as well but I figured there was probably enough butter in the recipe to begin with. 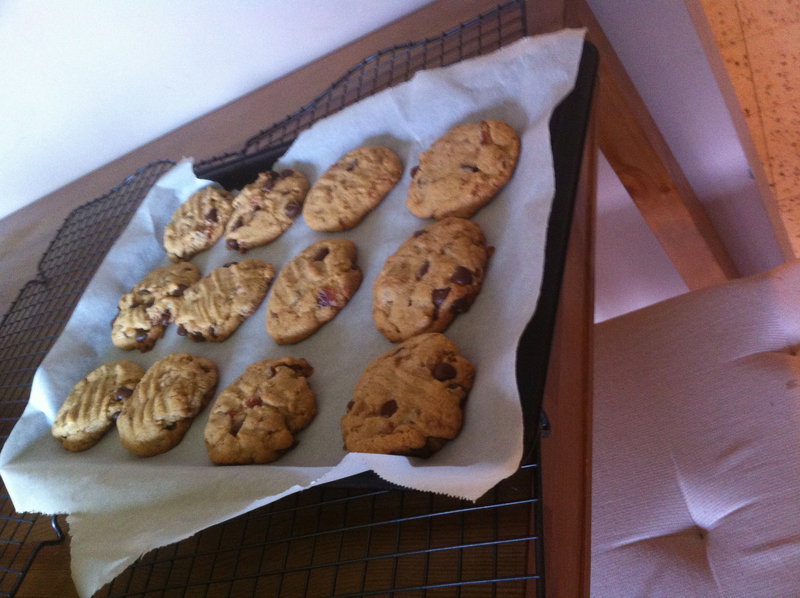 Supervise the chocolate chips carefully as they burn easily. Double boilers are advisable if you have one (I don’t). Add the butter to the sugar, whisking to combine. Add the vanilla and whisk again. Add the chocolate and the egg. Whisk whisk whisk. You should have a warm brown syrupy type mixture. Add the dry ingredients to the wet, and mix using hands if necessary. Take the dough, divide it into two chunks, then roll each chunk into a log shape on some wax paper. It may help to refrigerate it for about an hour (maximum or it turns to a cold rock! Found out by accident…) before you try to divide it if the dough is super sticky. When you have your log shape, wrap it in the wax paper like a candy (twist the ends) and then fridge it for at least two hours. Then take it out and slice it into 1/4″ thick circles and bake at 325 for 15 minutes. Let cool on wire racks before icing. Adjust cooking time if needed after the first batch. Add vanilla and mix into the butter. Add the icing sugar about 1/2 cup at a time to avoid sending dust everywhere. Mix mix mix. It will seem chunky then smooth out again after you mix it thoroughly. Add the milk and mix it in. Taste to make sure you didn’t mess up (this is my favourite part). Add food colouring if you’d like! I used the blue and purple that I used in my rainbow cupcakes. Now add about a tbsp of icing per cookie and make a sandwich! Om nom nom nom.